Jim was up first this AM, he made coffee, I made a smoothie. Jim walked up to get new gate code. I went and took a shower, started eggs for breakfast and he came back shortly after that. Did the rest of our normal routine. Chris picked me up at 10:30 and we hit a few of her favorite clothing stores in San Diego. I was looking for jeans and cargo shorts and a few shorts and shirts for Jim. I found a set of 8 blue melamine dinner plates I was looking for, very pretty can put in dishwasher but not the microwave. We went in a total of three stores, she brought us a smoothie so we could use the bathroom, then we went back to the FW with Jim. I made all three of us lunch. Salad and leftover veggie soup. We rested a bit were watching MOM. 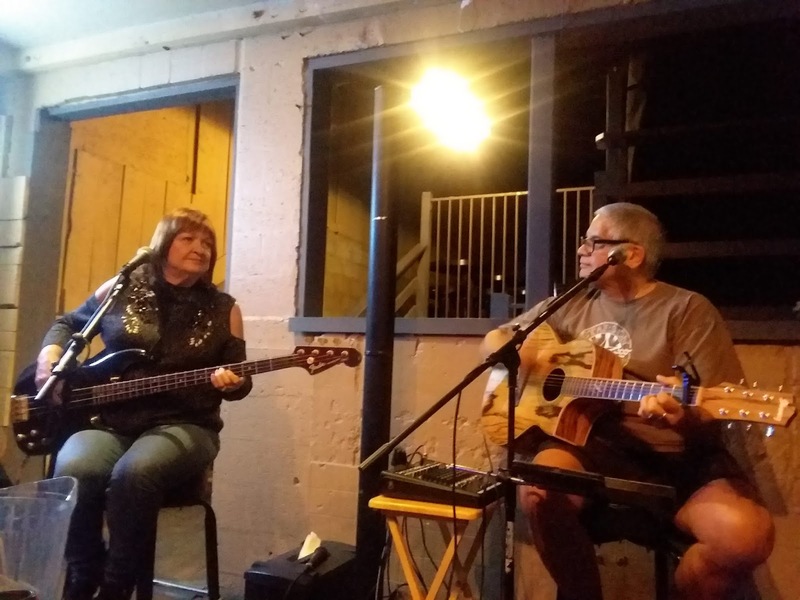 We left at 5 to go to Desi's Bar and Grill to here Jerry Gontang sing for the 5 th time now, we all really like him, and Sharon Shoemaker joined him on base guitar. SOooo good. Jim and I shared a fish and chip basket and zucchini fries. We said goodbye and hugs everyone wished us safe travels. We left after 10 pm, and back to the RV, what a fun evening with new friends.